Safe for pets. Bad for pee! As a pet lover your main concern in removing the pet odors in your carpet is the safety of your pets. You’d much rather deal with the odor in your carpet than to dump a bunch of toxic, over the counter chemicals in your carpet and put your pet’s health at risk. Am I right so far? Outstanding! I want you to become more educated about pet urine removal in your carpet and upholstery, as it pertains to the health of your pets and children, so I’m going to get all Carpet Chemist nerdy on you, but you’ll be really glad you read this once you’ve finished. Let’s dive right in and within 10 minutes you’ll be a certified Jr. Carpet Chemist! The Carpet Chemist company has devoted thousands of hours in our Chemist Lab creating powerful solutions for stains and odors that are more importantly nonthreatening to people and pets. The Carpet Chemist says: We all love our pets but when accidents happen it can be frustrating. Grab a BIG 16oz. bottle of our super secret formula, specifically designed to destroy pet odors. LEVEL 1. 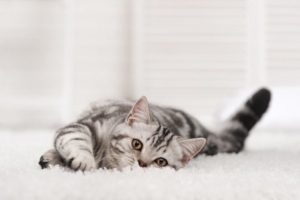 Topical- The most common and easiest level of pet urine odor removal from carpet is topical. That means we are only treating the small pet urine odor stains on the surface of the carpet, visa vi the carpet fibers. LEVEL 2. Carpet padding- A general rule of thumb to remember is that if you see a pee stain on your carpet, it’s generally 3 times the size in the carpet padding, since your carpet padding is essentially a giant sponge. That being said, carpet thickness, type of padding, and other variables will determine if that’s probable in your case. If it is, The affected carpet padding section must be either cut out and replaced with new, or a subsurface extraction tool with urine destroying chemicals must be used to remove the pee from the pad. LEVEL 3. Sub flooring- Sub flooring treatment is commonly needed in the case where pets become incontinent and simply have no control of their movements. There is no saving the padding in a level 3 pet urine decontamination. The carpet may still be salvaged but first the concrete of plywood subfloors must have an odor barrier application thoroughly applied. Once it dries, the fresh new padding will be installed. Finally, the carpet backing will be decontaminated, carpet re-stretched and fastened, and the top of the carpet will be decontaminated and cleaned. Many times carpet can be replaced much cheaper, so this level of treatment may be reserved for higher quality carpet. CAN YOUR CARPET BE SALVAGED? Before throwing in the proverbial towel, give The Carpet Chemist a call to discuss setting up an on site appointment to have your carpet evaluated. If it’s not worth saving, we’ll let you know without hesitation. Typically if your carpet is more than 20% contaminated with pet urine, it’s going to be a loss, and we would recommend you start looking into new flooring options. Find out what customers are saying about our cutting-edge process and five-star service! You can also request a free quote for our pet urine removal service!